Size: 6.5" x 3.3" x 1.7"
If you call the SR-52 a pocket calculator you need really huge pockets. Introduced in fall 1975, this wonderful calculator integrated a card reader for magnetic strips, a huge memory for 224 steps and the revolutionary AOS entry into a housing similar to the SR-50A calculator. By the way, the SR-52 was the thickest calculator ever with a whooping 1.8". Together with the calculator a "Printed Cradle" PC-100 was introduced, a thermal printer and plotter which secured the SR-52. Remember the year 1975, a SRP of $395 was no bargain. The SR-52 was clearly placed against the Hewlett-Packard HP-65, later the HP-67 got identical memory space to the SR-52. The SR-52 was an important milestone in the history of programmable calculators based on the TMC0501 building blocks for scalable scientific calculators introduced with the SR-50 and leading to the legendary TI-59. The remarkable SR-52 uses most features of the TMC0501 architecture. A deeper exploration of the calculator shows a TMC0501 Arithmetic chip surrounded by one TMC0524 SCOM, two TMC0561/0562 BROM (bare ROM like a SCOM without the scanning feature necessary for the keyboard). In addition you'll notice on the printed circuit board (PCB) two TMC0599 RAM chips for program and data and finally a TMC0595 controlling the internal magnet card read/writer. A similar calculator was sold with the huge desktop-model SR-60. The related SR-56 lacked the magnetic card reader. 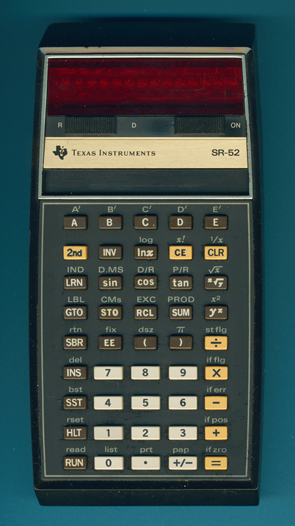 In November 1976 Texas Instruments announced PPX-52 (Professional Program Exchange), a service for SR-52 users in the U.S., Canada and Mexico to gather, compile and redistribute programs for the calculator. It was in Fall 1977, shortly after the introduction of the TI-59, merged with the PPX-59. All PPX-52 Newsletters are available for free download as a service provided by the Datamath Calculator Museum. Don't miss the secrets of the SR-52 and read about some Undocumented Features. At first glance the calculating precision of the SR-52 was reduced from 13 digits to 12 digits compared with earlier scientific calculators based on the TMC0501 Arithmetic chip, for instance the SR-51. But fellow collector Palmer Hanson revealed in October 2009, almost 35 years after its introduction, the remaining secrets of the SR-52. Don't miss the Story "Twelve or Thirteen Digits on the SR-52." If you are interested in the calculating accuracy of scientific calculators, don't miss the Calculator forensics. If you are interested in "huge pocket calculators" you should view the Canon Palmtronic F-7 and Casio PRO fx-1. The SR-52 is featured in the Texas Instruments Incorporated bulletins CB-SR52 dated 1975, SR-52_FL, CB-195A dated 1976 and in the Texas Instruments Deutschland GmbH leaflet ER-1976 dated 1976. Fellow collectors - if you own a SR-52 please report us the serial number and date code on the back of the calculator for our SR-52 Database.